Vital, sensitive and often indispensable data requires the utmost security when being accessed from external or internal locations. Fully compliant with Federal Information Processing Standard (FIPS) 140, Host Gateway Server (HGS) offers a flexible solution to data protection with a mixture of encrypted and non-encrypted connections. Secure Socket Layer authentication and encryption affords secure connections when required, such as from systems outside the enterprise network. 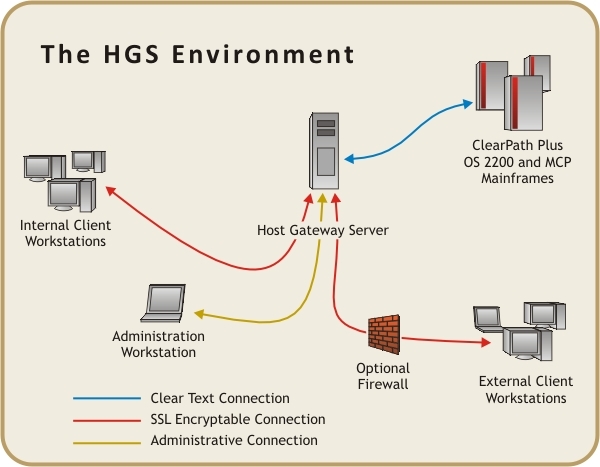 For connections not requiring encryption, HGS allows clear text messaging, as well. Host Gateway Server can support multiple application client types, from the feature-rich eXpress Enterprise terminal emulator to the lightweight browser-based client. Applications developed with eQuate fit flawlessly within the HGS framework. The support of existing terminal emulators permits the enterprise to leverage its current investment in terminal emulation software.